The Community Link Booth is a one-stop-shop for patients, families and carers to connect with community-based services and organisations. Patients are encouraged to visit the booth while they are at the hospital or upon discharge to find out what services may be available in the community to provide support once you leave hospital. You can find the booth near the main entrance of Fiona Stanley Hospital – see our map. The booth is staffed by volunteers from ConnectGroups (external site), who can provide referrals to non-clinical support, resources and information, and link people with community services. Volunteers staff the booth from 8.30am–2.30pm, Monday to Friday. 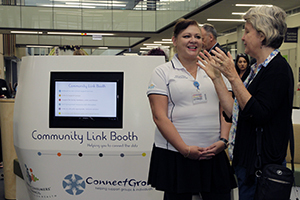 The Community Link Booth is a collaboration between ConnectGroups, the Health Consumers’ Council of WA and Fiona Stanley Hospital.